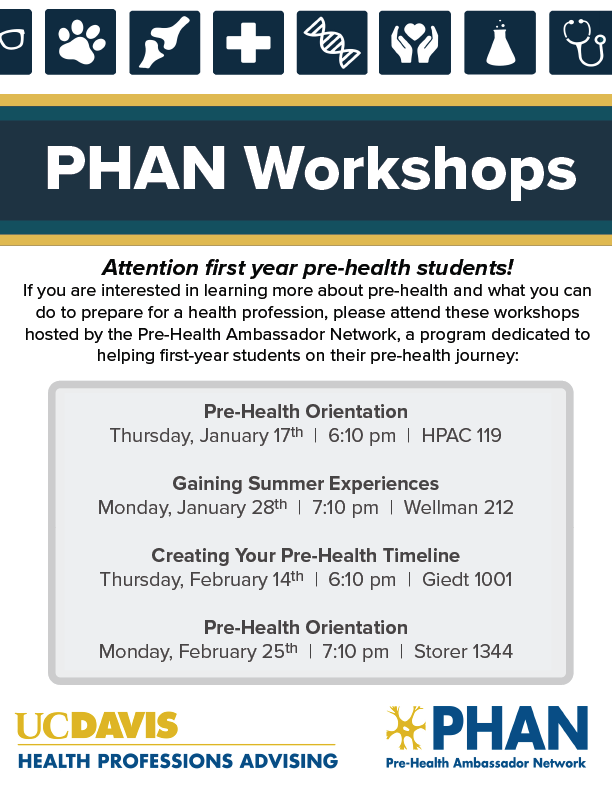 The Pre-Health Ambassador Network (PHAN) is a student ambassador program run by students for students, so if you're a first-year pre-health student, this is for you! PHAN is made up of several student ambassadors whose mission is to provide you with a support network that will guide you through your transition to UC Davis and to help you establish a strong foundation upon which you can grow as a pre-health student. We provide workshops and networking events that will aid you in your transition to college and provide valuable information in preparation for your career in the health professions. The path to a health profession can be long and difficult, but we're here to help along the way, so be sure to join us as you navigate through your years at UC Davis. Interested in being an ambassador and helping first year pre-health students? Please return here in Spring Quarter 2019 for application details. Questions? Contact PHAN at hpamb@ucdavis.edu.